10518 is a key level. I'm more interested in shorting this on the break of this level. i think any rally at 10518 may be short lived imho. If any of you folks are taking the long on.....i would say use guaranteed stops, as this move quickly and fast, and may result in some slippage if the trade was to go against you. My next entry is around 10518 on a first attempt basis. Im going long there and with a 50 point stop. The price is still 200 points away but im only gonna trade this if it comes to my price and not before. So one to add to watch list . My stops activated and i made a nice profit. This example shows why its important to have stops and protect your winnings. Last Edit: 22 Apr 2016 12:32 by remo. im long now and my stop is below 10781 , thats 200 points. But this is the jpy so fast moves is normal and big swings. Possible 123 low formation ??? Ive got my order to go long above 10975 with stops below the 2 point if activated. 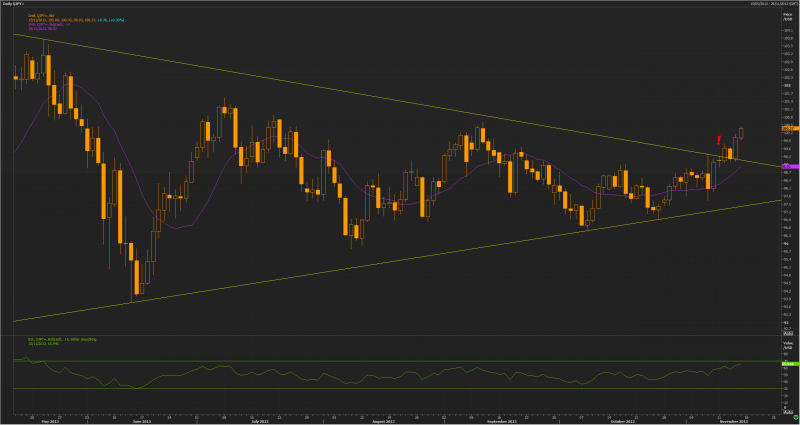 Worth a long on a first attempt of trendline with tight stops of 40 points or if your braver then below nearest support. This level has 2 convergin supports near by so hopefully will bounce on first attempt. Could have been worse, the Yen Cross is (in)famous for losing cash and shirts too. Anyway, please find attached Nomura Bank's technical take on the USD/JPY. p.s. Off/Topic to Remo: That Metastock / Reuters package is a monster! Last Edit: 15 Nov 2013 11:44 by remo. Last Edit: 07 Nov 2013 16:31 by remo. This looks like its breaking out today???? im already long from the initial breakout with a 40 point stop. One to keep an eye out on. I favor a move up and keep an eye on the higher high since September for early indication as well. 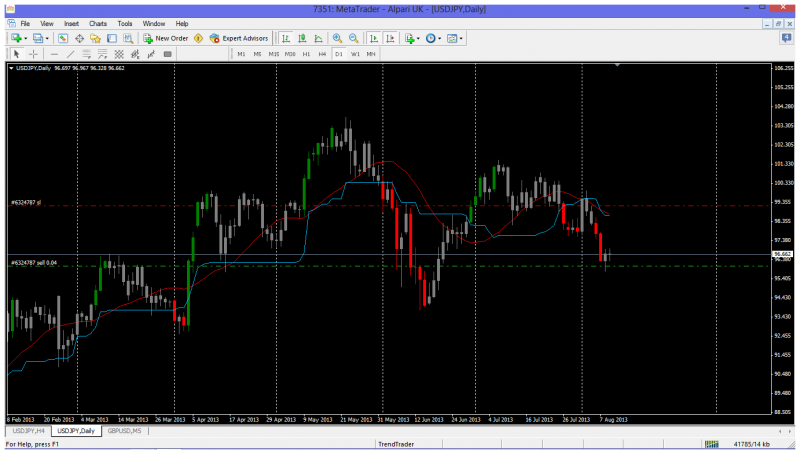 Im going long on a break above 9901 with a 40 point stop. This is a volatile currency so not for beginners . Its a free trade now. Resistance points just under 100, and then just under 101 perhaps? Apologie for the poor chart offered, currently at work with limited access! I think you're correct Nev.That's how I see it. this is the only entry I am not happy with at present as I should have been short at the beginning of the week. however with news etc. it was always a risk, so now have a short to see if we can retrace the main upthrust. Either way, I'll take a small short at the RSI trendline resistance whatever the price is then. OK, thanks diver. 5th failures are always possible so we'll see. Either way, I'll take a small short at the RSI trendline resistance whatever the price is then. That would make it a failure at 102.41. A 114.6 ext of wave 4 gives 105.19; or a 123.6 ext gives 106.09?? I agree Diver. That last move down does look a lot like a wave 4 so I'd add the height of wave 1 to the wave 4 low for a possible target. Not sure where that comes in as I'm on my phone atm. Another possibility is this is a wave 5; the wave 4 being from 103.74 down to 93.79, which would be 38.2% of wave 3. If this is the case this could well go to 106.09, being 123.6% of wave 4. Thanks Jackozy, I'll certainly keep a look out for that area from now on and cross reference it with other possible resistance, and also watch price action more carefully. I think the theory behind my trade today was ok, but my trigger happy early entry was rather poor. It's a lesson I am going to have to learn, and learn faster than I am doing! I know it's already past the 61.8% Fib so this could be considered a little hindsight analysis but I've been really short of time lately so couldn't post this yesterday sorry. Anyway, I remember a poster on here by the nickname of Ki who seemed very good at FX trading and he mentioned the frequency that the 78.6% Fib gets played rather than the 61.8% Fib which we normally see in stocks. Bearing that in mind, my view on this pair is that it's either going to make new highs (could the last drop have been a wave 4? ), or the place to short it is in the 101.59 area. Short from 9977 with a 50 point stop and 100 target. possibly preemptive, but I believe this could top here for the short term. I am thinking the 9993/10000 level is a good level to go short for a first touch shorter term trade. Things are looking ugly. All kinds of support levels approaching. Somewhere around 92.50 could be a first port of call in what looks like a 5 way move down form the recent high. 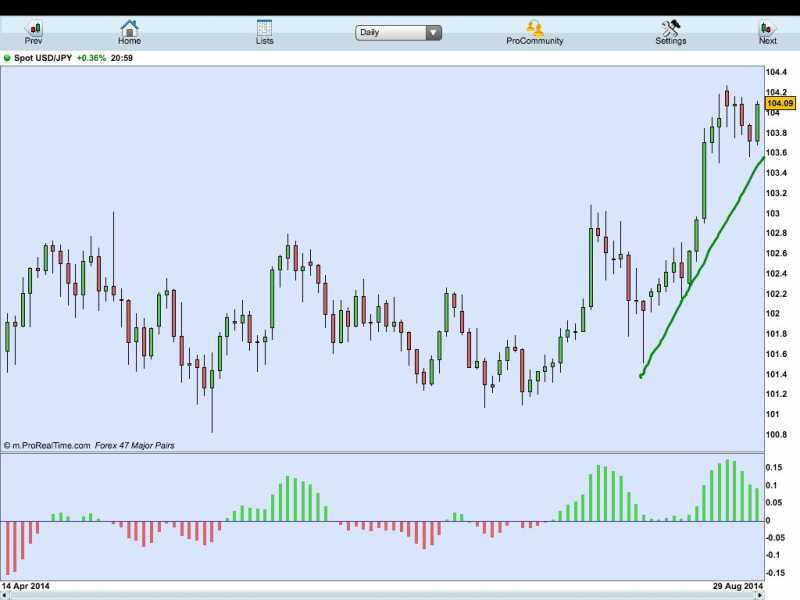 Nice hammer on the usdjpy pair. entry half way down the hammer with stops below. not for the faint hearted due to volatility. This could be bouncing of the short term trend line. stops below the recent low at 10068. The risk is small compared to the reward. This is a very volatile currency so nopt for the faint heart . Last Edit: 27 May 2013 23:23 by remo. 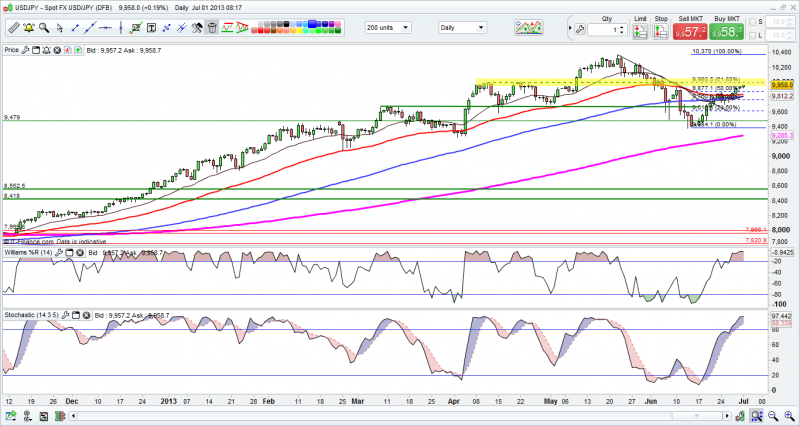 The question is: will the daily and 4H bearish divergences prove stronger than the uptrend support or vice versa? Either way there should be some good pips to be made quite soon on this pair. There's a bearish RSI divergence coupled with a lower high and a possible second lower high where the RSI downtrend came into play from that bear div. These followed lower lows. A close below 95.748 will mean a failed breakout and a close below 94.28 will mean a further lower low and more downside IMHO. I initially went long on the backtest of 95.748 but have now reversed that and am short (bit early really) as the price came back to the breakout level a second time suggesting it's not likely to hold. On its own that's not a decision-maker, but added to everything else was enough for me to open the short, if only a small position. Stops above 96.132. This has bounced of this level a few times now. So there is a chance this may breakout soon. shorting at 9498 has already gone as its already bounced of on first attempt basis. But the fact that its still hanging around this level now increases the chance of a breakout tomorrow. so keep an eye out on the NFP tomorrow as that may send this flying. This pair has moved a large amount since i first mentioned this. If your already short on this protect your winnings. make it a free trade just encase. Nice head and shoulders in play?